The sheer amount of stuff that happens on a single Saturday at Dimension Jump would put an entire weekend at other conventions to shame. It's immediately up bright and early for those who've managed to snaffle tickets to this morning's photoshoot sessions - with the opportunity to pose alongside a quite incredible lineup. 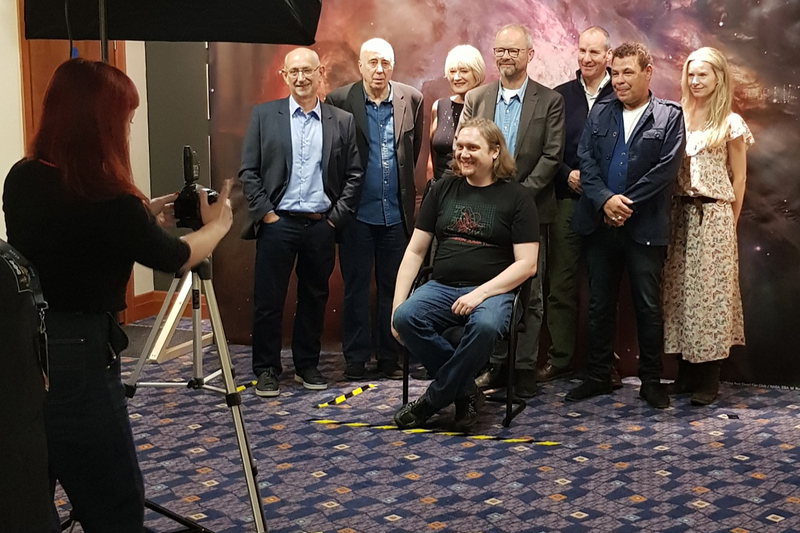 Craig Charles, Chris Barrie, Robert Llewellyn, Norman Lovett, Hattie Hayridge, Chloë Annett and Doug Naylor are all in the room - something that hasn't even ever actually happened during the filming of a Red Dwarf episode. The resulting photographs will surely take pride of place over wedding and baby photos in the households of many of the fans present. 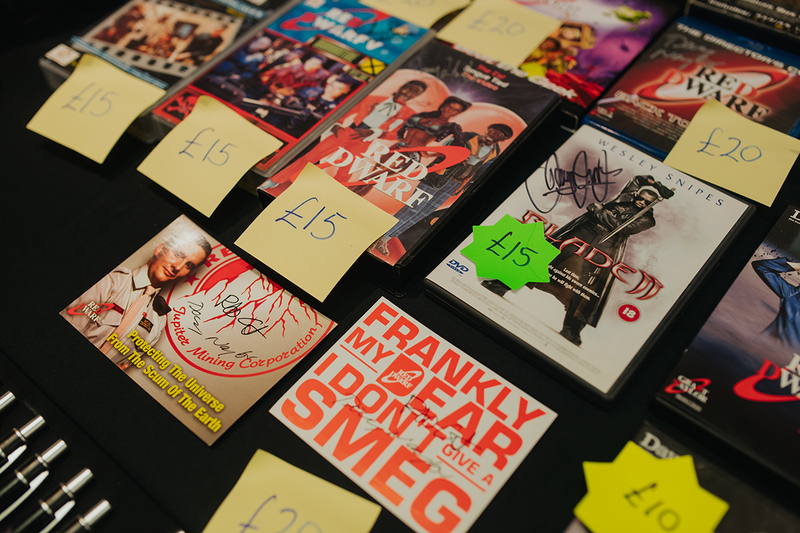 In the meantime, while we wait for the main hall events to kick off, those who aren't queuing for photos can choose to get their first look at the merchandise room - a fantastic opportunity to plug any gaps in collections, as well as visit with the actual, original screen-used Starbug brought along by Mike Tucker - or simply hang out in the hall watching videos of episodes and bonus features that play inbetween panels. There are so many guests to get through this weekend that rather than there being two Q&A sessions on Saturday morning as per usual, we've got three. 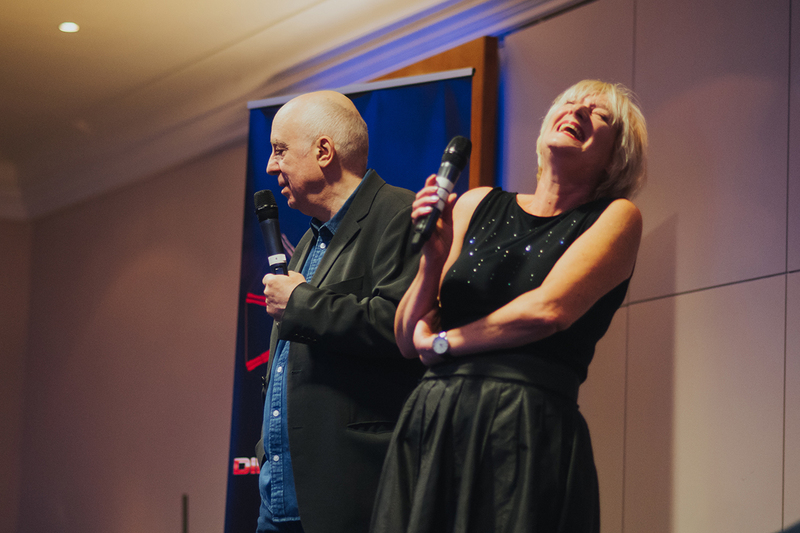 The first sees a two-for-the-price-of-one on Hollies, as Norman Lovett and Hattie Hayridge - both long-established as comfortable with a mic in their hands and an audience in front of them - take to the stage. Unsurprisingly, Norman is asked to reflect on returning to the show for Series XII's Skipper. "When I saw myself in Series XII, I just looked at myself and thought... What the f**k? But someone online went Oh, he's so ollllldddddd! With all the Ls and Ds! When I saw that, it hurt me to see it. But I'll get over it. It was just one person, it was very cruel... but he'll be dead eventually!" A question is asked about whether the shift from Norman to Hattie in playing the character was a forerunner to many of the debates currently going on around trans issues. "We were ahead of the game!" says Hattie. "I don't even like to think about it, 'cos I didn't want to leave," says Norman. "But look what's happened since: a sexual revolution!" "The change in gender wasn't part of what was written," adds Hattie. "I had to audition [despite having played Hilly]. They auditioned men and women when I went along." "They said to me they were going to get a completely different character," grumbles Norman. "But they didn't, did they? They got a female version of me!" "You haven't done 30 years at all, have you?" says Norman, needling his opposite number about the anniversary celebrations. "I started in '88!" shoots back Hattie. "So, you've done 29 years?" "I am 29 years old, yeah!" While Norman shares his opinions on the development of Red Dwarf-referencing American sitcom behemoth The Big Bang Theory (if you're interested, it's that he thinks it went downhill after Sheldon and Amy got physical), and Hattie tells a story about a fish market, the Q&A is over far too soon - as things have to get swiftly moving straight on to the next event. 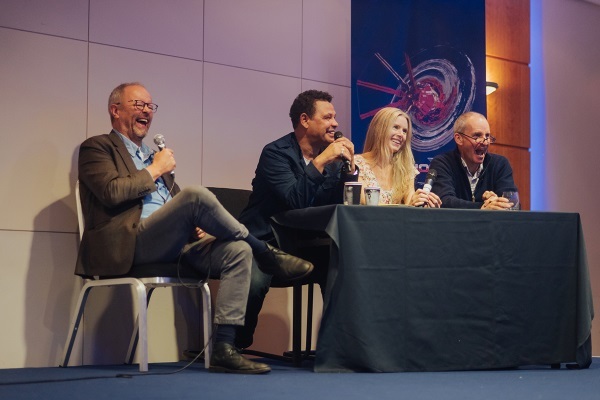 And with Craig Charles, Chris Barrie, Robert Llewellyn and Chloë Annett making up the biggest panel ever to take to a DJ stage at once, what an event it is. They're only missing Danny John-Jules, who can't make the Saturday festivities due to his appearance in Strictly, but who has been announced as making a surprise Sunday appearance to complete the full set of lead cast members. Not that he's entirely absent from the Q&A, with the others taking the opportunity to laugh about his habit for... not always being exactly where required during filming. "There was a scene [on Series XII] where Chris, Craig and I were in front of the audience remembering our lines, getting it right in take one," explains Robert. "And then we turn around, waiting for Danny to make his big entrance, and we hear Yeah, guy, I'll be there at 10.30 - on his phone, on the microphone!" Asked about unanswered questions or unfinished plotlines the cast would like to see picked up on in future series, Craig says that he'd "like Lister to actually get to Fiji!" Robert's not so sure: "I know if we got to Fiji there'd have to be a scene where I had to carry a tray along a beach in the incredible heat, in my costume. Sirs, whose idea was it to shoot in f**king Fiji?" Don't worry, though, Craig assures him: "The budget would only stretch to Southport!" 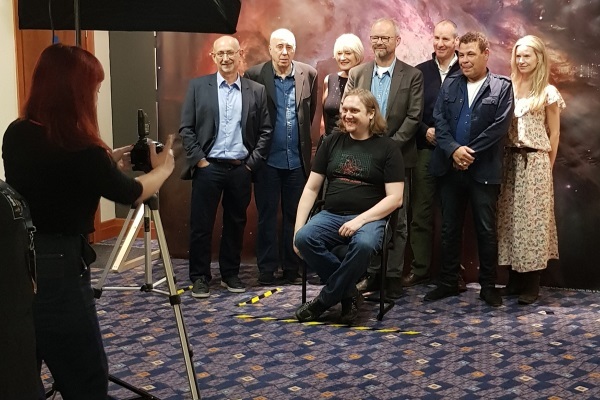 As for plotlines that the cast have wanted to do but which haven't happened, Robert mentions again his "baby Kryten" idea that's come up in Q&As before. "I wanted to do a music video," says Craig. "With Kryten on drums, me on the guitar, Chris on keyboards, and Danny on bass." "Keyboards is a bit dull, isn't it?" says an affronted Chris. A great question from a young audience member - whose presence sees Robert apologise for having "used some bad words" - sees the gang recall the most far-flung places they've been recognised. "In A&E!" replies Chloë. Chris was recognised in Barcelona - but for The Brittas Empire - while Craig recounts trying to help a friend who had been hit by a van in Brixton, only to have an onlooker say "Hey! You're that guy! Have you got a bit of paper?" Robert, however, trumps everyone by telling a story of being in Australia's Curtin Springs. "It's a filling station about four thousand miles from anywhere else. An Australian gentleman was complaining about the heat. He went, Mate, aren't you the bloke out of Red Dwarf with the funny head?" A thoughtful question posed to Chris is that if he were to read the scripts for Brittas Empire and Red Dwarf now, which one would he choose to do? The answer is diplomatic, as he explains that while he was in his 20s, the enjoyment of Red Dwarf was in reading such fast-paced, gag-heavy scripts, whereas Brittas ones were slow burners. "But now," he says, "I'd still say Red Dwarf... because it's the backbone of my career!" "It really has been a career defining role," says Craig. "All of the things in my career, none of them would have happened if I hadn't played Dave Lister in Red Dwarf. People ask me if I worry about being typecast. But if you're going to be typecast as Dave Lister... there's worse people to be!" "Sometimes Lister has to be the emotional anchor," says Craig, when asked if there's ever anything about the scripts on a character level that the cast take issue with. "I sometimes wish he could get to be more funny more often... but he's the anchor of the whole show." Asked about their most fun moments on the show, the cast think back fondly to the most recent series. 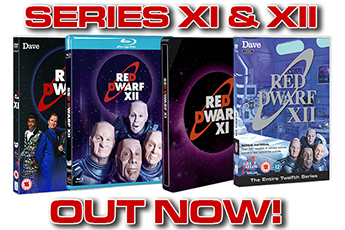 "I think XI and XII was some of the most fun we've had on the show," says Craig. "The chemistry was really good," agrees Robert. "And the storylines as well," Craig continues. "A lot of the stuff we did back in the day was science fiction that's now become science fact. And we felt that the stuff in Series XI and XII was science fiction that might become science fact in the future." 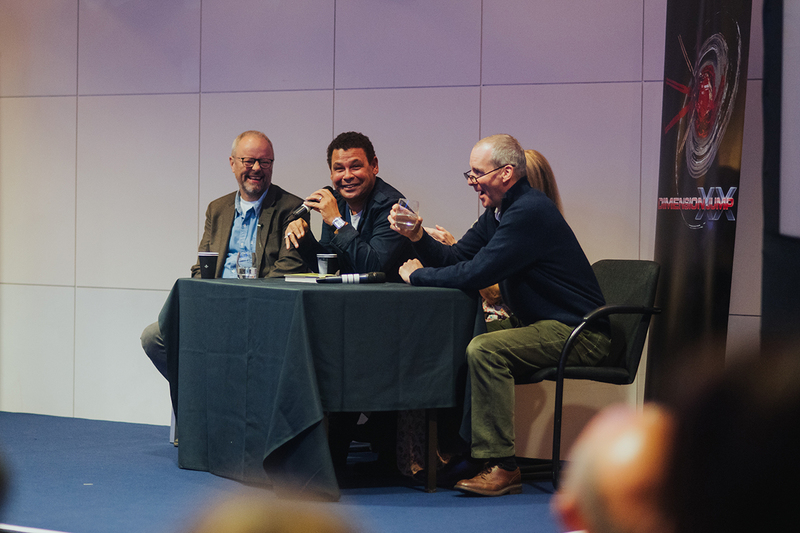 You suspect that the quartet could happily sit on stage chatting back and forth for several hours - but the clock is still a-ticking, and we've got another important guest to line up. So they're ushered away, and on comes Ian Boldsworth - Dave-era warm-up extraordinaire and Series XII guest - to introduce a very special Q&A with co-creator Doug Naylor. 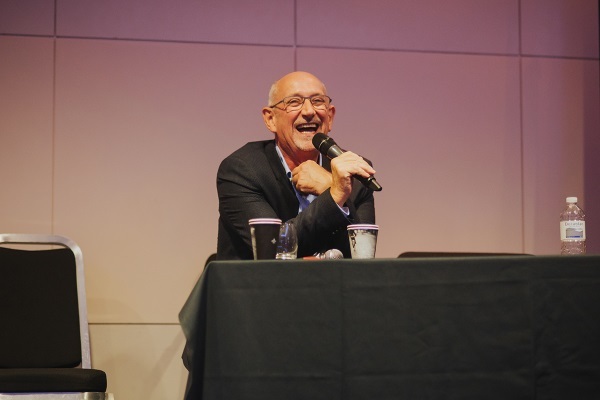 Having served as the warmup man on the show himself, Ian is interested in finding out more about the dynamic between being entrenched in the making of the show, and seeing the reactions of the audience when presented to them. "It's really strange," says Doug, "[on the earlier series] the only feedback you ever got - because it was before social media - was friends calling, and family calling, and that was it. And because I'm not an actor, nobody recognised us - so we got no feedback! "And then when the Fan Club came along, and said they wanted to form a club, we were like... really? Why? There are fans out there, they said. What, like ten of you? No, there's more than that! And obviously people were watching it, but you didn't really add one and one up." "There's a huge commitment on the Fan Club's part," says Ian, "that almost feels like a love affair. Kind of a symbiotic relationship?" "Yeah, I think that's right," replies Doug. "When UKTV resurrected it, that was because people watched the repeats. They wanted to do what appeared to be a little clip show, then I persuaded them to let me write some scripts for it. But the budget was so minute. But then again, because the figures were great, we were able to resurrect it for another series." "How does it feel to know that the show has that massive groundswell of support?" asks Ian. "Because I'm convinced that even if the show hadn't come back, this convention would still be happening now." "Absolutely," agrees Doug. 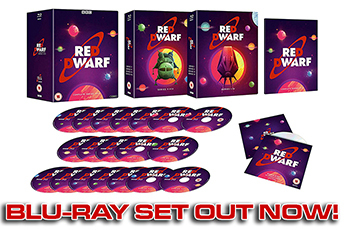 Ian then swerves the conversation on to the upcoming Blu-rays, where Doug confirms the news of their release date being pushed back to January 2019 - and that there'll be 19 discs of content. But this also comes with a tale of some original model shot film reels being discovered on eBay, with it having transpired that they had been taken out of a skip! "How far ahead do you write the show?" asks Ian, to which Doug replies "always ahead of the recording of the show!" 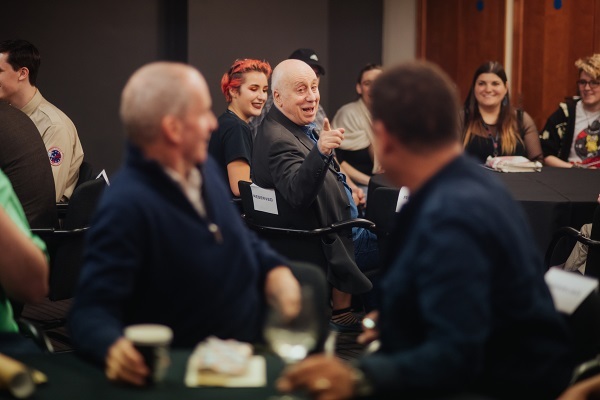 Elaborating a little further, he does admit that that can be "scarily near to the start of the show", but also that one of the strengths of Red Dwarf is that the cast "don't mind being given extra laugh lines up to the day before the record". Both agree that the honing of something based on what's gleaned during the actual recording sessions are to the benefit, rather than the detriment. "I have a whole bank of story ideas, and I dip into that depending on what I need," explains Doug, to the question of whether there's an ongoing Red Dwarf story in his head. "I hate the idea of a blank page - where I've got no ideas at all, but I have to just sit there and think of something. So I'd rather write something where I don't necessarily quite know where it's going, but I have a starting point - so I'm doing, say, a sleeping quarters scene where Lister's run out of water or something, and then even if I don't know where it's leading, at least I feel like I'm doing something." Doug further explains that individual episodes stem from a wide range of factors - from budget, to cast size, to effects availability, including the time that Back to Reality essentially came from the effects team requesting to try out a new way of shooting underwater footage. Turning over to the audience for questions, one fan begins by thanking Doug for "whatever part of your soul you've donated to Red Dwarf." 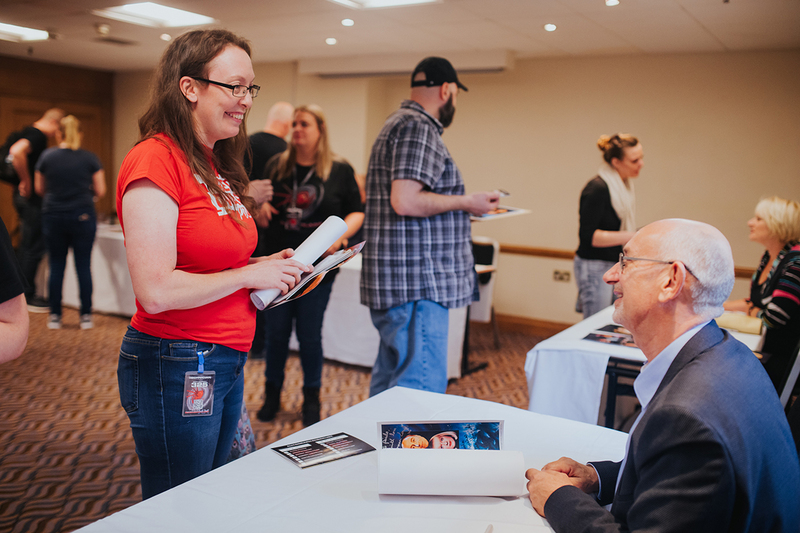 "Just before you go on," replies Doug, "can I just say thanks to all you guys, and the amazing job the Fan Club have done - not just this weekend, but for years and years. Because without you, we wouldn't be able to make Red Dwarf, and we're humbled and grateful that we're still allowed to make it, and have been for the last thirty years. 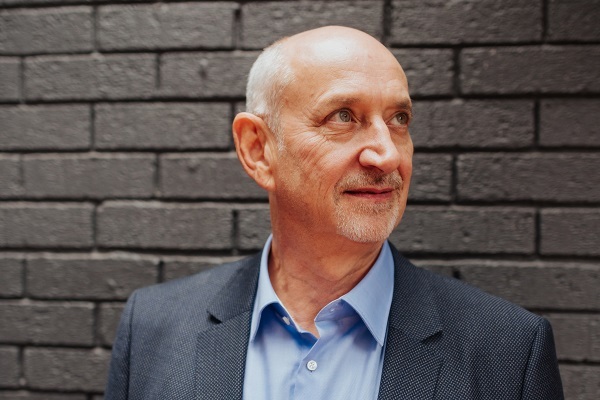 "And we've had loads of brilliant people and crews over the years, but I've also got to thank Rob, for all the work we did together for many years, and Paul Jackson who sold it, Peter Ridsdale-Scott in Manchester, who had the extraordinary insight that he believed it was going to be a hit, and Ed Bye, who did such a fantastic job across all those series. And of course the four main guys, who've been amazing, and Hattie, and Norman, and Chloë, and everyone else. I just want to thank all those people: thank you!" "He'll probably thank me in private later," adds Ian. On the question itself, Doug is asked if he had any inkling that the show would be something that could run for thirty years. "I thought it was going to be a much bigger hit than it was immediately," he replies. "But this was before we shot it, and before I saw the set! The deal was, it was going to look cool - if we were going to do sci-fi, it wasn't going to look like Blake's 7, it wasn't going to look cheap. And we spoke to Ed, and he said, it's going to look like a submarine. So I thought, fantastic, it'll be this fantastic grey submarine thing. Of course, I didn't realise that submarines looked like grey wood!" Ian then remarks how funny it is that a set that was initially disliked by the crew has now taken on such iconic status that during the filming of Skipper, there was huge excitement and emotion among the audience at seeing it again. Sadly, Ian goes on to explain, he himself rushed down to get a photo of the set after shooting only to find it had already been dismantled! "It was a strange situation," says Doug, "because I had to keep going to the set designer, Don't make it any better!" Doug is asked how he's overcome such issues as writer's block and self-doubt over the years. "I generally deal with them by not writing," replies Doug. "It's a really useful solution! One of the things you can't replicate is a deadline - a deadline where you know that if you don't write something, you're finished, totally humiliated, end of your career. It really forces you to write - because you either quit, or you do it. But it's hard to do that before you've broken in." "As for self-doubt, everyone has self-doubt. Willy Russell, the Liverpudlian playwright, he had incredible self-doubt - but he wrote hit play after hit play. In the end, he had those deadlines, and he had to write something, and he came out somehow." "Do you know in your head where Kochanski is?" Doug is asked - with Ian speculating over whether or not the fan in the crowd asking is actually Chloë Annett. "Yes I do," is the reply. "I'm not telling you, but I do know where she is!" The final question, aptly enough, concerns the future of the show. "We're working very, very hard to achieve that," says Doug. "But at the moment that's all I can say. UKTV have been amazing, they've been very supportive, and there's a huge energy to do it. And hopefully the issues that need to be resolved will be resolved soon." After such an epic set of Q&As, you could be forgiven for thinking that would be it for the day - but no, we're only at lunchtime. 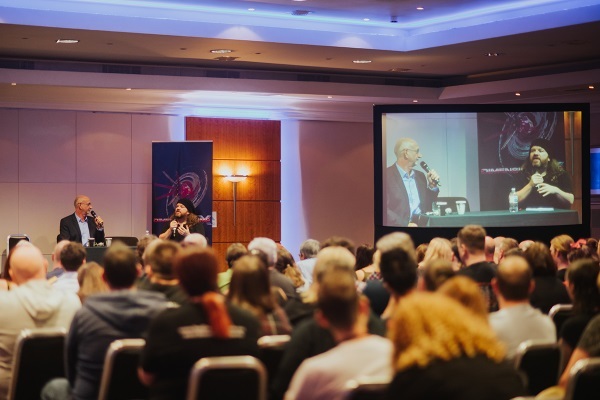 That means that some lucky fans get to head off for the weekend's first Coffee Lounge, in which those who managed to snaffle the limited number of tickets available to get to hang out with the day's guests in a more relaxed, informal environment. Each table gets a couple of guests, and after a few minutes at a time they rotate to the next one - it's kind of like speed dating, only with the stars of your favourite TV show. Over the course of Saturday afternoon, the business is all about the autograph sessions - with several hours required to ensure that everyone with a ticket can get their personal items signed by every available guest. But for anyone not queuing for autographs at a given time, the DJ Olympics are taking place in the main hall. 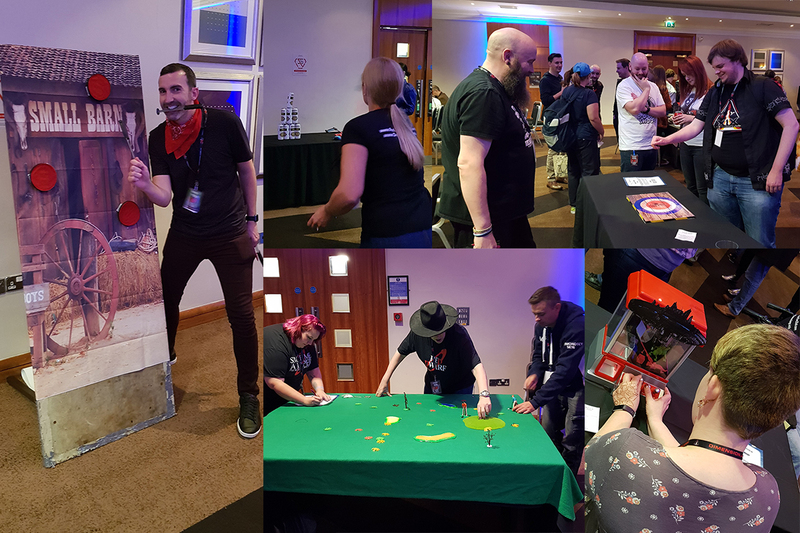 The Olympics have evolved over the years, with several fun carnival-style games inspired by the show offering attendees the opportunity to rack up the best score of the day and win a fabulous prize on Sunday. 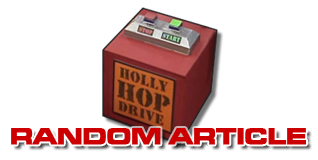 The new addition this year is a Siliconia -inspired grabber machine, which quickly attracts the longest queue in the room as players try to pick up lovely little 3D-printed models of Starbug, Lister, the Holly Hop Drive and more. Eventually, the autographs are done and the games have played their last. Which means, that when everyone's had the chance to go and have some dinner and get refreshed, it's time for... Saturday night.